This is a common question, especially for people who don’t use tools every day. Like most of us. Although they are based on the same concept, the powered and manual versions are generally used in much different applications. 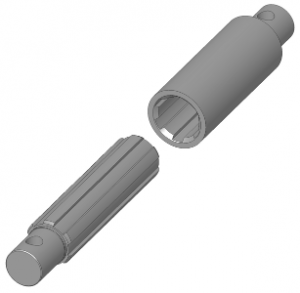 Hand or manual impact drivers are a simple looking cylinder with an attachment point at the end for a driver bit or socket. By striking the back of the driver, the downward force is converted to a short, but very powerful, rotational force. This quick energy pulse is great for breaking free rusted or overtightened nuts or screws. Since not all of the force is converted to rotational, there is an additional strong downward force applied to the screw. This is what’s referred to as positive engagement, and it prevents cam-out (when the driver bit comes out of the screw) which greatly reduces any chance of stripping the screw head. How does a manual impact driver work? An example of a splined shaft. This is straight, while an impact driver's is curved. The hand impact driver works because of its simple yet effective construction. A heavy sleeve sits around a light core, where they engage via a curved or twisted spline. When you hit the outer sleeve with a hammer, the downward motion of the sleeve on the splines causes the inner core to rotate with a very strong but short impulse. Often, this is all that is needed to break the fastener free from rust or over tightening. While the idea is similar – short, powerful bursts of torque – that is where the similarities stop. A cordless impact driver can deliver thousands of impacts per minute, as opposed to the manual driver, which is limited by your own arm. This means the power tool is great for things like driving tough screws or quickly removing nuts from a bolt. Another difference is the peak torque – while a strong power driver can get up to 1500 in-lbs of torque, the hand driver can deliver a shock torque of over 200 ft-lbs (2400 in-lbs). Additionally, the manual driver has positive engagement, as mentioned before, while the power tool only offers rotational torque. Should you buy a hand impact driver or cordless impact driver? Both! If you need them. If you mainly want something that can drive tough screws or lag bolts, a powered impact driver would be best for you. Read our reviews! This entry was posted in Articles and tagged manual. Bookmark the permalink. Both comments and trackbacks are currently closed.